Recently, we are more concerned about environmental protection and food safety issues. We attempt to optimize original food materials, food processing equipment and transportation equipment etc. We prefer to the automation, low energy consumption and new equipment. Industrial microwave dryer is one of the advanced unit which apply clean energy with the high efficiency compared with traditional drying equipment. The general heating method of microwave drying equipment relies on heating product itself. It could directly heat the core part of the object which do not influence on working. We call it Simple Material Heating solution. For example, when the microwave machine starts to works, the heating energy do not rise the workshop environment temperature. However, the traditional heating machine not only heat the material itself but also create a hot environment which workers do not feel comfortable. The heat generated by the microwave heating and the wastage of the heated object has a close relationship. All kinds of medium dielectric constant in the range of 0.0001 to 0.5, so the objects the ability to absorb microwave has is difference. Generally, dielectric constant of the big media is easy to absorb microwave heating, small dielectric constant of medium is hard to absorb microwave heating. 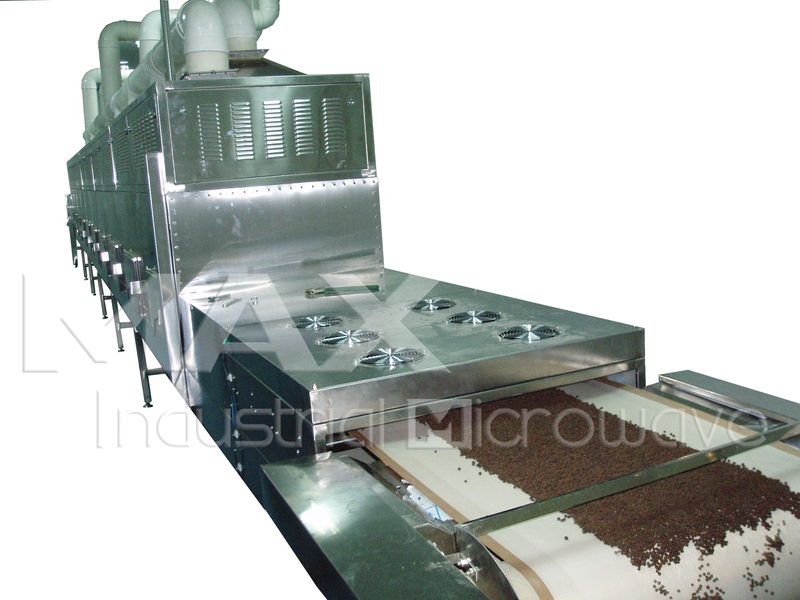 This is the characteristics of microwave drying equipment of objects with selective heating. Conventional heating methods really takes time to rise the temperature, when we shut down machine, the heating energy could not immediately such as steam heating, electric heating, infrared heating. But the microwave drying equipment can quickly start and shut down within a few seconds to achieve the desired result, heating to proper temperature, easy automation and continuous production. The microwave power absorbed per unit volume in the medium is proportional to the square of the electric field intensity, so that the processed object can rise to the required processing temperature in a very short time under a very high field intensity. The high temperature of field intensity can also play a role without affecting the quality of the product. Today, industrial microwave machine is popular used in the food industry. For your food industry application heating or drying application, please feel free to contact with us including bento meal reheating, starch sterilization, drying and modification, seasoning drying and sterilization, food products sterilization etc.